Bio Acidophilus is a high strength capsule containing Bio Care`s unique high performance ‘LAB4’ probiotics, (10 billion) viable organisms with fructooligosaccharides. 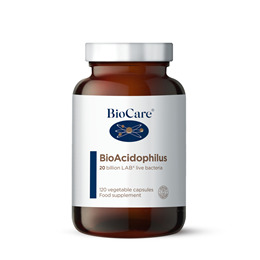 BioCare Bio Acidophilus provides lactobacillus acidophilus to maintain a healthy balance of intestinal microflora. Fructooligosaccharides (F.O.S.) when ingested, provides a specific food source for the growth of friendly intestinal bacteria. Our digestive system is colonised by billions of bacteria, and most of them are harmless. However, a favourable balance between the beneficial and the pathogenic bacteria must be kept to maintain a healthy, naturally regulated system. Lactobacillus acidophilus and B. bifidus have been shown to support healthy dietary cholesterol when taken in conjunction with a low fat diet. 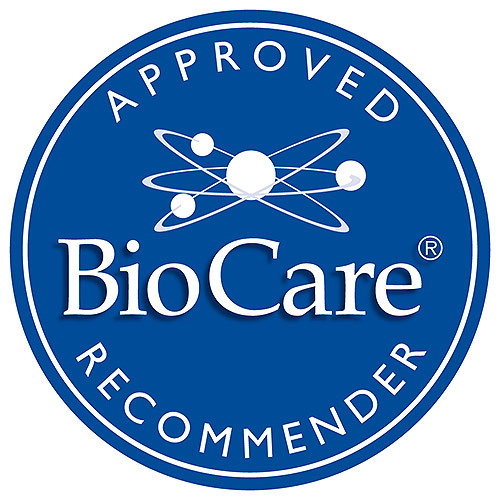 Take a look at our BioCare Adult Multivitamins and Minerals and BioCare Polyzyme Forte to find out more about the benefits BioCare products have to offer. Bulking Agent (Cellulose), Fructooligosaccharides (F.O.S), Capsule shell (hypromellose), Lactobacillus acidophilus, Anti-caking Agents (Silicon Dioxide and Magnesium Stearate), Bifidobacterium bifidum and Bifidobacterium lactis. Children 1 - 2 years: Take half a vegicap a day with food or as professionally directed. Children 2+ years: Take 1 vegicap a day with food or as professionally directed. Adults: Take 1 vegicap twice a day with food or as professionally directed. Below are reviews of Bio Acidophilus - F.O.S. - 120 Vegicaps by bodykind customers. If you have tried this product we'd love to hear what you think so please leave a review. I think this is a good product. I am an ex sufferer from Candida and every so often I still keep taking this product to maintain my gut health. I was put on this by a specialist after an anti candida diet, it balanced my gut with needed bacteria, which helped my medication absorb and reduced bloating, been using for over a year now and swear by it. 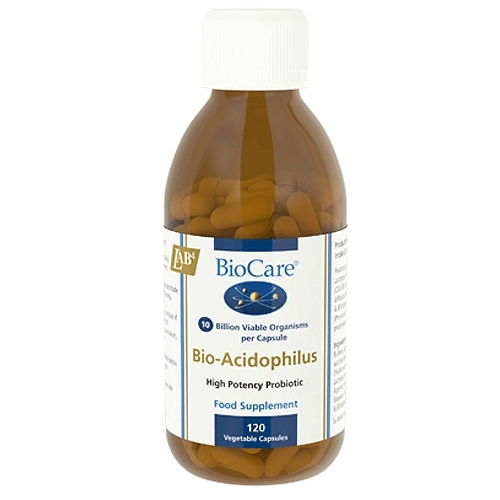 BioCare Bio Acidophilus provides lactobacillus acidophilus to maintain a healthy balance of intestinal microflora. When ingested, Fructooligosaccharides F.O.S. provides a specific food source for the growth of friendly intestinal bacteria.